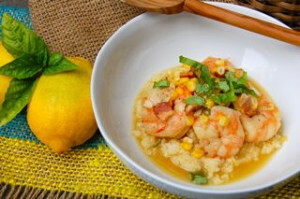 A recipe to delight – the creamiest of grits, topped with sweet succulent shrimp tossed among red pepper and onion slices with some heat from the butter and to cut through that richness some pickled celery. Inspired by one of the best meals in Nashville and adapted by this northern girl , who can’t find okra so easily out of season but celery is a good fill in and using some sriracha for heat since it’s a condiment of the moment to add the right amount of heat to the dish. Enjoy. From by the bay, wishing you a shrimp and grits food memory! Heat all the ingredients except the grits and cheese in a pan on the stove. Turn the heat to low and then add the grits. Stir frequently until soft, about 30 minutes, then add the cheese. In large saute pan, heat the oil and add the bell peppers and onions. Saute until starts to soften. Add shrimp and cook 1/2 way, add the butter and continue to cook until shrimp is done. The shrimp should be pink and no longer translucent. 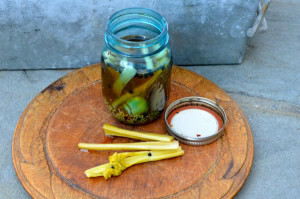 Serve over grits and garnish with pickled celery. 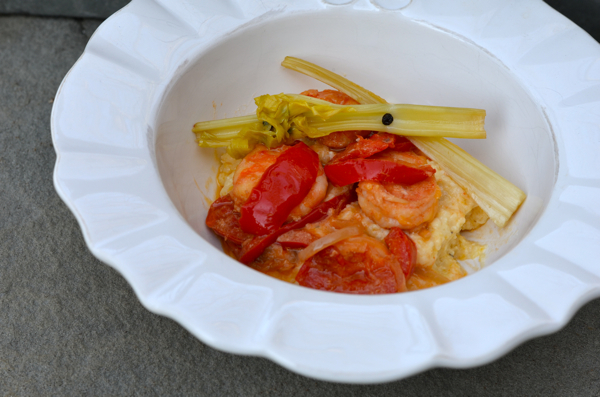 This entry was posted in main dish, seafood and tagged cheddar cheese recipe, cheese grits, flavored butter, pickled vegetables, shrimp and grits, shrimp and grits northern style with pickled celery, spicy pickled celery, sriracha recipes on March 10, 2016 by entertainingbythebay. This dish highlights the bold flavor of broccoli rabe with it’s nutty and distinctive bitter taste, that is much loved in southern italian cooking. I love broccoli rabe not only for the taste , but also that it’s packed with loads of vitamin C and A as well as potassium, while being low in calories. 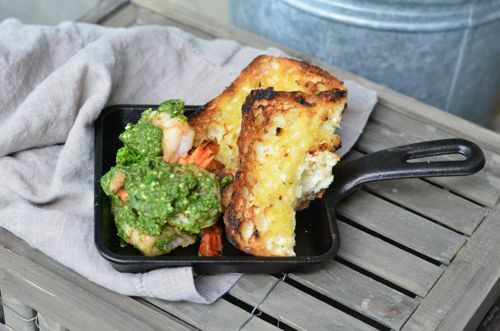 So this delicious and light dish features an easy pesto , grilled shrimp and bread kicked up with some red chili flakes for a little heat. It’s perfect light, delicious and vibrant colored meal! From by the bay wishing you a bold broccoli rabe food memories! 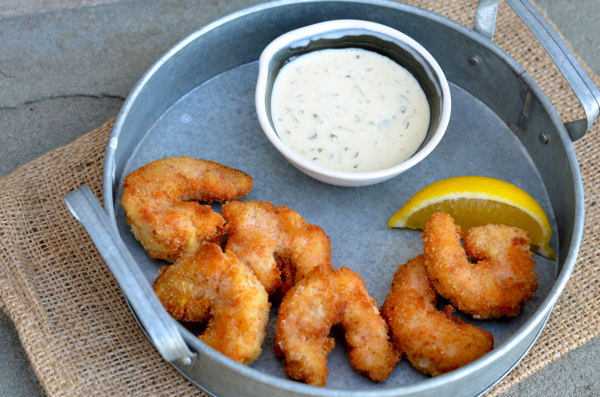 In a resealable plastic bag add shrimp, 1 tablespoons olive oil, 1 tablespoon lemon juice and 1 teaspoon lemon zest. Let shrimp marinade in refrigerator for 3 to 4 hours. Bring a large pot of well-salted water to a boil. Set up a bowl of well-salted ice water. Cook the broccoli rabe in the boiling water for 1 to 2 minutes and then immediately plunge in the salted ice water. This will prevent the broccoli rabe from being overcooked and will set the lovely green color. Drain the broccoli rabe and squeeze out any excess water. Pull out about 1/2 cup of the broccoli rabe, especially the florets and set aside. 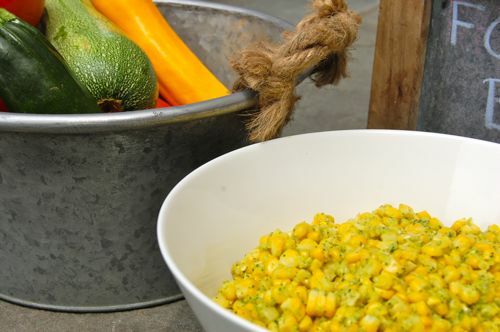 Place the remaining broccoli rabe ( approximately 1 cup) in the bowl of a food processor and puree until it is a coarse paste. 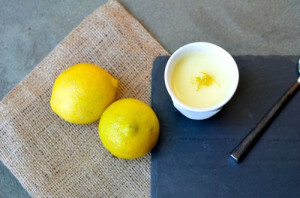 Add 1/2 cup olive oil, almonds, lemon zest, lemon juice and parmigiano and puree until smooth. Taste and adjust the seasoning salt and pepper to taste. Serve room temperature. In a small bowl add remaining 2 tablespoons olive oil, minced garlic and red chili flakes and mix. Cut the ciabatta bread length-wise in half and brush the inside with the olive oil mixture. Prepare grill . Remove shrimp from marinade and cook until the shrimp turns pink, about 1 1/2 minute on each side depending on the heat of the grill. 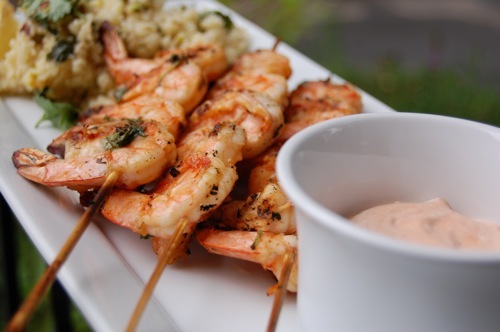 Remove shrimp and place bread on the grill , cut side with olive oil past down and grill until toasted brown. Remove from grill. To serve dish add shrimp , cover with broccoli rabe pesto and cut bread into slices arranging around the shrimp and pesto. Drizzle with a little olive oil before serving. Note: This could also be make on stove top in a grill pan. Heat a tablespoon of olive oil to cook shrimp on both sides until pink and then grill bread face down in pan until toasted. Tip: When buying broccoli rabe look for bright green and crisp leaves. Never buy with any yellow leaves. 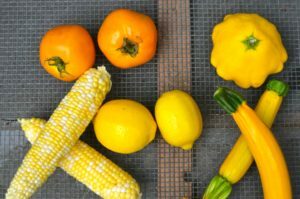 This entry was posted in main dish, seafood and tagged broccoli rabe recipes, grilled shrimp recipes, italian food, italian recipes, pesto recipes on September 11, 2014 by entertainingbythebay. Each summer our family would visit my mother’s sister Julia and her family at the Jersey shore. It was a big treat for all of us. We would spend our time running around outdoors and then come in to a wonderful meal. 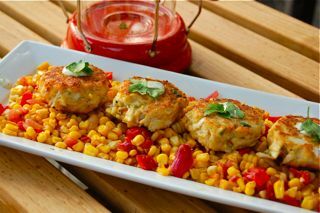 What better summer seaside meal then crabcakes. My aunt served them with tartar sauce and lemon. 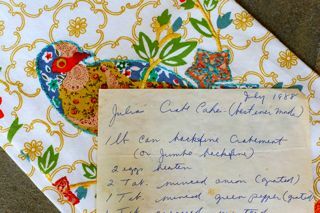 So when my mom finally got around to getting the recipe, she named the crabcake as Julia’s Crabcakes (best ever made). This is no exageration. I didn’t touch my aun’t recipe for the crabcakes. How can you improve on the best ever made? I did add some cilantro mayonnaise and placed on a bed of sauté red peppers with fresh corn, Yum! From by the bay wishing you the best ever made food memories! It’s very important that the lump crabmeat is very well picked over for any cartilage. Add to a bowl. In a small sauté pan use 1 tablespoon of butter and sauté the onion and pepper until very soft. Add to the crabmeat. 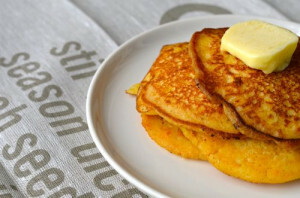 Add the remaining ingredients except butter into the bowl. Form 8 crabcakes patties. Place on a tray and cover with plastic wrap. Keep in the fridge for an hour. Using a large skillet, melt butter and sauté cakes until golden brown. 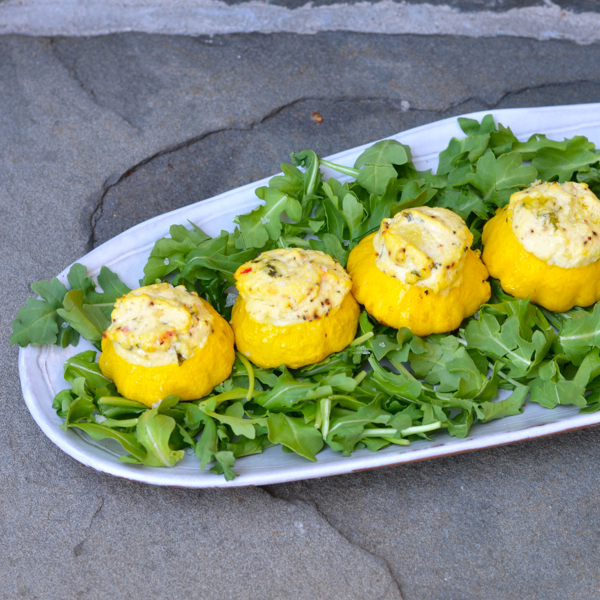 Place on a bed of the red pepper and sweet corn sauté, add a little cilantro mayonnaise to the top of each cake and a few cilantro leaves. 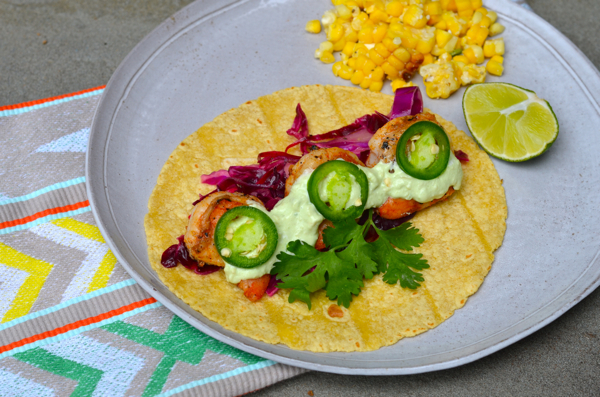 Serve remaining cilantro mayonnaise to the side. In a food processor combine olive oil, garlic and water. Add cilantro and puree. Add mayonnaise, Tabasco lime juice and zest and blend again. Remove and place in glass jar cover and refrigerate until ready to serve with crabcakes. This entry was posted in main dish, seafood and tagged cilantro recipes, crab cake recipes, crab recipes, Family recipes, lime recipes, seafood recipes, summer food, summer recipes on May 24, 2014 by entertainingbythebay. Last weekend I had guests out from the city visiting by the bay. So when I was thinking about what to serve my friends so that they could really experience the waterside, of course lobster came to mind, the quintessential waterside dish. 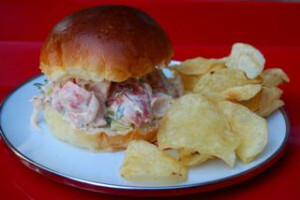 I love lobster rolls and I make it many different ways. 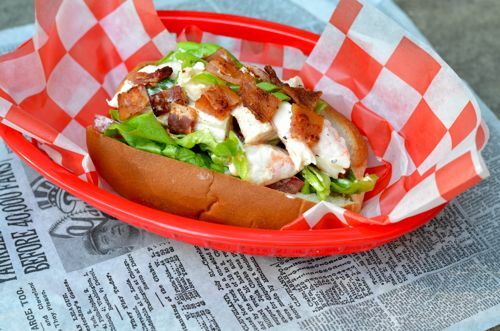 Sometimes I just want the simplicity of fresh lobster meat , a toasted roll and melted butter and it’s delicious. This weekend I wanted to kick up the ingredients for my lobster salad with Old Bay Seasoning to add warmth to the taste of cool mayonnaise, fresh herbs such as parsley and the slightly licorice flavor of tarragon and a touch of fresh lemon juice to brighten all the flavors. My friends were taking the train from Penn Station, I told them to come early and I would pick them up in Port Washington and we would head over to the pier to buy some fresh lobsters. Once by the bay, I steamed the lobsters and made my salad. After a walk to the beach, we came back to have a terrific lunch of lobster rolls on the deck. What a perfect day! From by the bay wishing you perfect waterside memories! To a bowl add lobster, scallion and celery. In a separate bowl , whisk together mayonnaise, mustard, lemon juice, tarragon, parsley, old bay seasoning, salt , pepper and cayenne pepper. Pour over the lobster mixture. Blend well. Place in refrigerator covered until ready to use. Melt butter and brush the insides of the roll. Toast in a 400 degree F oven 4 minutes until golden brown. Fill buns with lobster salad and serve. This entry was posted in main dish, Sandwiches, seafood and tagged lemon recipes, lobster recipes, lobster roll recipes, old bay recipes, seafood recipes, summer food, summer recipes, tarragon recipes on May 24, 2014 by entertainingbythebay.